Each week, we’ll bring you the AP’s college football rankings, and throw in our patented mix of bitchy sarcastic analysis and incredibly premature snap judgments. Let’s get to Week 6! Continuing their disregard for lesser teams, the Crimson Tide beat Georgia State 45-3. Disappointed that his team surrendered three points, Nick Saban intends to ban cleats during practice this week. The Ducks threw up another odd number, beating Colorado 57-16. The Buffaloes did lead for six and a half minutes in the first quarter though, which is a step forward for a program that until last season had been coached by a child who wished on a penny and turned into an adult. The Tigers jumped out to a large early lead and then coasted to a 49-14 win at Syracuse. It win was the latest victory in their campaign against other orange entities. They're coming for you next, yams! The Buckeyes trailed for much of the game but emerged with a 40-30 win against Northwestern. Unfortunately, Urban Meyer does not believe punters are human beings, so he instructed his players to shatter the will of Wildcats punter Brandon Williams. They did well. Despite being outgained by over 200 yards, the Cardinal withstood a late rally and beat Washington 31-28. Much of their offense came from Ty Montgomery, who recorded 290 all-purpose yards and the most Stanford name ever. The Seminoles scoffed at Maryland’s ranking, beating the Terrapins 63-0 thanks in large part to Jameis Winston. Despite the loss, the Terrapins say they enjoyed their time in the Top 25 and that it was an honor just to be included. The Bulldogs needed a very late fourth quarter touchdown and a fumble from Tennessee running back Pig Howard (!!!!!!) in overtime, but they beat the Volunteers 34-31. Nickajack Lake will be diverted accordingly. The Cardinals are probably getting bored, because they only beat Temple 30-7. Thankfully, they’ll have tougher competition ahead, with games against… WAIT, the best teams on their schedule are UCF and Houston? God dammit! The Aggies were furloughed this week. They play Ole Miss on Saturday. The Tigers pulled away from Mississippi State, outscoring them 28-0 in the fourth quarter, to win 59-26. After the game, Les Miles approached the podium, took out a deck of cards, removed a joker from the deck, slammed it down on a table, and walked away. Thanks to passing, rushing, and receiving touchdowns from quarterback Brett Hundley, the Bruins beat Utah 34-27 in Salt Lake City. After the game, Hundley, who also had a punt during the game, overestimated his ability to do anything and attempted to desalinate the Great Salt Lake with his mouth. He will miss the rest of the season with dehydration. Although the Sooners’ offense was quiet for much of the game, their defense stifled TCU en route to a perfectly acceptable 20-17 win. It was a big win for Bob Stoops, who earlier this week revealed he does not like his quarterback. The Hurricanes shrugged off an early 10-point deficit and came back to beat Georgia Tech 45-30. The loss came in the wake of Georgia Tech's misguided Rambling Wrecking Ball promotion, in which a scholarship was to be awarded to the student who studied naked on a wrecking ball for the longest period of time. Although they let Kentucky get back in the game in the fourth quarter, the Gamecocks emerged with a 35-28 win. It was a weird week for South Carolina - Steve Spurrier expressed doubts about the severity of Jadeveon Clowney’s injury and created some problems of his own. The Bears avenged last season’s 70-63 loss with a 73-42 win in which they recorded a Big 12-record 864 yards of total offense. In the postgame news conference, head coach Art Briles recored another 213 yards of offense on his own. The Huskies’ potential game-tying drive stalled when a catch on fourth and 10 that was ruled to be a trap, and Stanford beat them 31-28. The loss was especially hard to take because Stanford’s players were blinded by Washington’s helmets on every play. The Gators were plainly better than Arkansas this week, winning 30-10. Ironically, Will Muschamp regularly shaves with razorbacks, but in an act of solidarity with his team he used a conventional razor in the days leading up to the game. The Wolverines were not tested this week, beating Minnesota 42-13. The win allowed Michigan to retain the Little Brown Jug, because the Big 10 is our most adorable conference. On the biggest stage the Wildcats have had in a generation, they were not able to hold off Ohio State, losing 40-30. 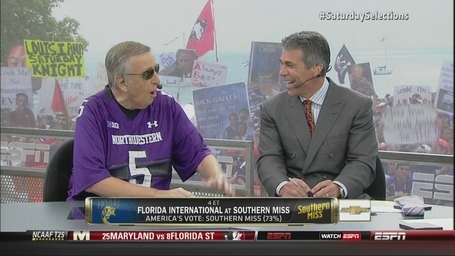 The day wasn’t a total loss though, Northwestern’s sign game is strong. The Red Raiders exploded after a foolish fake punt when it was 10-10, beating Kansas 54-16. After the game, Kliff Kingsbury acknowledged that he is only playing a bit part in Charlie Weis’ perpetual descent into madness. The Bulldogs continued their undefeated season, beating Idaho 61-14. With their excursions to the lands of pineapples and potatoes each of the last two weeks, their agricultural tour is also going well. The Cowboys forced five turnovers but were only able to stumble to a 33-29 win over a mediocre Kansas State team. On the bright side, the Cowboys have not outed themselves as a group of homophobic fools. Behind a career-high 266 rushing yards from Cameron Stingily, the Huskies beat Kent State 38-24. They think Maryland’s appearance in the Top 25 last week was cute. Logan Thomas tied his career high with three touchdown passes, and the Hokies beat UNC 27-17. They think Maryland’s appearance in the Top 25 last week was inspiring for such a small program. The Tigers opened their SEC schedule with a 51-28 win over Vanderbilt. They haven’t really played anyone yet, so they sympathize with Maryland and hope to avoid a similar fate. Also receiving votes: Brent Musburger, Paul Rhoads, brick walls, nonsense 2-point conversions, the San Diego State band, imaginary football, this Texas cheap shot, another real squirrel, sexism.